Vent-Miser Programmable Energy Saving Vents | OhGizmo! Central heating or cooling systems are the easiest way to maintain a comfortable temperature in your home, but they can also waste quite a bit of energy when they’re pumping warm or cool air into rooms you rarely use. You can always just seal that room’s entrance with cinder blocks, drywall over the doorway and pretend it doesn’t exist anymore, or try these considerably easier to install Vent-Miser programmable vents instead. 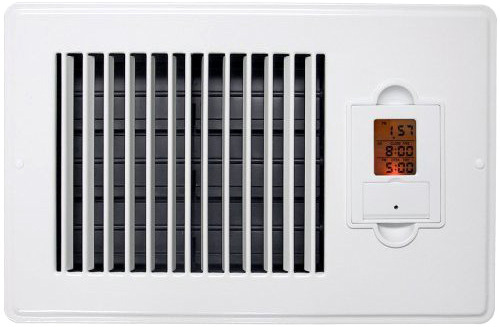 They’re designed to easily replace the vent covers found around your home, and can be programmed to automatically open or close at set intervals for different days of the week. They don’t actually tie-in to your home’s heating or cooling system and don’t feature a thermostat, but if that guest bedroom stays unoccupied for a good part of the year, it seems like an easy way to save a few dollars on your power bill. The Vent-Misers are available from Amazon in different sizes and colors ranging in price from $22.49 up to $27.00. If the guest room is unoccupied for most of the year, why not just manually close it yourself? Cost: Free.